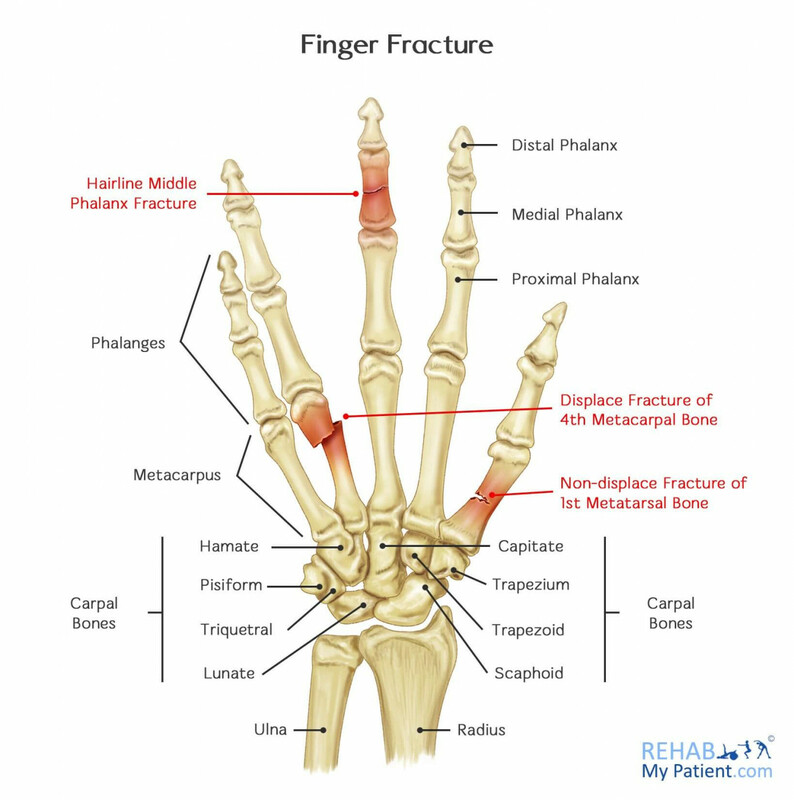 Generally, a fractured finger occurs as the result of an injury to your hand. You can fracture a finger when you slam your fingers in a door or put out your hands to break a fall. You can fracture a finger during a ball game if the ball jams your finger. Carelessness when working with power saws, drills, and other tools can result in a fractured finger. Swelling of the fracture site. Tenderness at the fracture site. Bruising at the fracture site. Inability to move the injured finger in completely. Deformity of the injured finger. If you think you fractured your finger, immediately tell your doctor exactly what happened and when it happened. Your doctor must determine not only which bone you fractured, but also how the bone broke. Bones can break in several ways. They can break straight across the bone, in a spiral, into several pieces, or shatter completely. Your doctor may want to see how your fingers line up when you extend your hand or make a fist. Does any finger overlap its neighbor? Does the injured finger angle in the wrong direction? Does the injured finger look too short? Your doctor may X-ray both of your hands to compare the injured finger on your uninjured finger on your other hand. Your doctor will put your broken bone back into place, usually without surgery. You’ll get a splint or cast to hold your finger straight and protect it from further injury while it heals. Sometimes your doctor may splint the fingers next to the fractured one to provide additional support. Your doctor will tell you how long to wear the splint. Usually a splint on a fractured finger is worn for about three weeks. You may need more X-rays as you heal so your doctor can check the progress of your finger as it heals. Depending on the type and severity of the fracture, you may need surgery to have pins, screws, or wire put in place to hold your fractured bones together. Begin using your hand again as soon as your doctor determines it is okay to move your finger. Doing simple rehabilitation exercises each day will help reduce the finger’s stiffness and swelling. You may be required to see a physical therapist to assist you in these exercises. For more information on fractured fingers, including symptoms and treatment, talk with your orthopaedic surgeon.